The Show Me The Votes Foundation sponsored five citizens’ exit polls in S.E. Kansas to assess the accuracy of machine vote counts. The results of these citizens exit polls provide tangible evidence of election fraud in the presidential race. 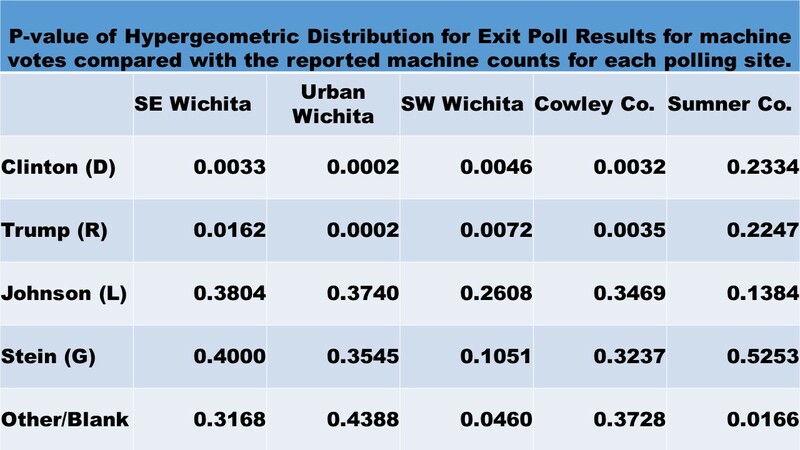 I designed the exit polls explicitly so they would provide evidence of election fraud should any be present. The only better evidence would be an audit showing the discrepancies in the actual ballots. But audits of the voting machine results are not allowed in these Kansas counties. Exit polls – taken as people are leaving the polling place – are extremely accurate at capturing the vote share of candidates. Staffed by volunteers from the polls open to their close, we achieved outstanding response rates. These are shown in the table below. 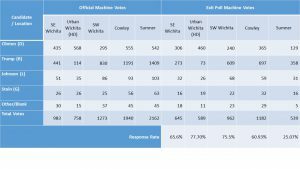 eta: after final counting, the SW Wichita votes for Trump changed from 609 to 611. A rule of thumb is that 2% or larger difference in vote share between the official results and the exit poll is evidence of election fraud worth investigating. We had such excellent response rates at some of our sites that differences significantly smaller than 2% are considered suspect in some races. 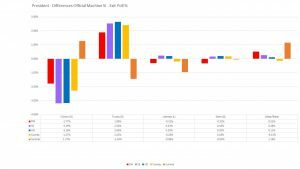 In addition, we can take into account the overall composition of differences between the official results and the exit poll statistics for each site. For example, at the Wellington polling site in Sumner County, all Republican candidates had lower vote share in the machine counts than in the exit polling results. This consistency is suspicious even though the differences may be small. The exit poll results indicate that our machine generated counts are being manipulated. 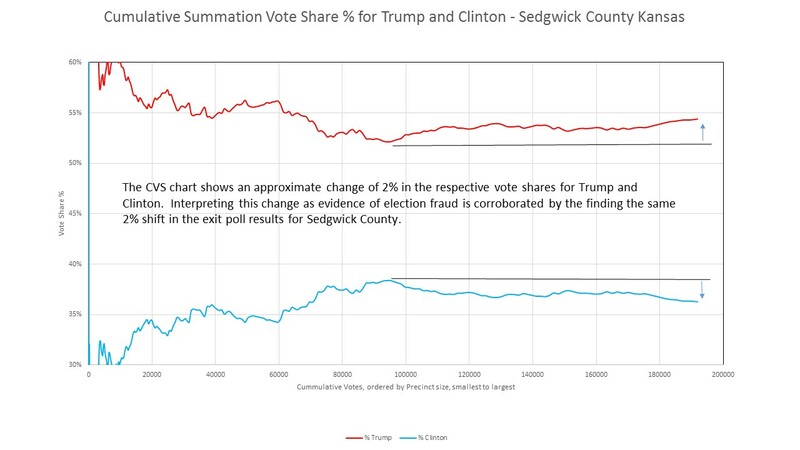 Polling sites in Sedgwick and Cowley counties were manipulated for the benefit of some candidates, most notably Trump at all four of those sites. Results in Sumner County appear to be manipulated to the detriment of Republican candidates – but not necessarily to the benefit of Democrat Candidates. Libertarians performed better in the machine counts for both the Senate and the 4th District races than exit polls indicated for all five sites. These differences are not sizable enough to alter the outcome of most races, but they are consistent and larger than expected by chance alone. I’ll post more about those results as I do a more detailed analysis for each polling location. Votes for Hillary Clinton were shifted to Donald Trump in four of the five polling locations we surveyed, Sumner being the exception. This chart shows approximately 2% to 3% of the machine votes were shifted from Clinton to Trump at those sites, adding 4% to 6% of the vote share to the difference between them to benefit Trump. The other candidates show only normal error rates. 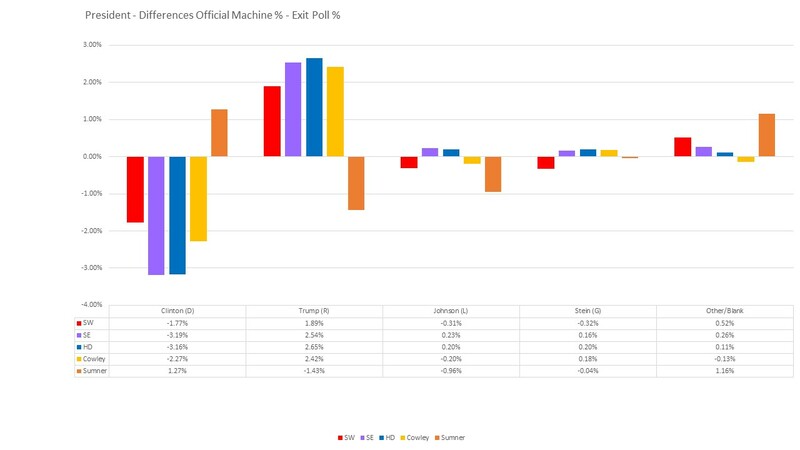 Figure 1 – This graph shows the difference between the machine vote share and the exit poll vote share for each candidate at each site. Positive values show that the machine count benefited that candidate. Negative numbers indicate a loss compared with the Exit Poll results. 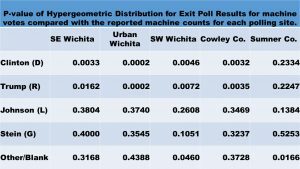 Sites in Sedgwick and Cowley Counties show a distinct bias with the machine counts siphoning votes from Clinton and benefiting Trump. Sumner County exit poll results for the Clinton and Trump were not statistically significantly different from the machine counts for Sumner County. 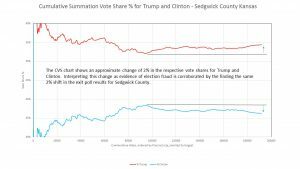 Since Trump won Kansas with 54% of the vote to Hillary’s 36%, even assuming this shift held across Kansas (it didn’t), it was well below Trump’s margin of victory, so this manipulation of votes did not alter the outcome. Still, it is disturbing evidence that the machine vote counts are being altered. In other states, which use similar equipment, manipulation at this level could have changed who won the Presidency. I computed the exact probability of each candidate getting the vote share they received in our exit poll given the official counts for that polling location. This was computed using the Hypergeometric probability distribution, which takes into account both the size of our exit poll sample and the number of people who cast votes at that polling location on Election Day. This probability – or p-value – is the exact computation of the probability of getting our exit poll results assuming no election fraud occurred. The p-values for the different presidential candidates at each of the five exit poll sites are given in the table below. The p-value represents the level of concern about the official results given our exit poll results with 1.0 indicating everything’s normal, nothing of interest here and zero indicating Red Alert Danger Will Robinson! Danger! The computed p-values always fall somewhere in-between. The probabilities for Johnson and Stein are all quite reasonable and raise no serious alarms regarding the accuracy of their vote counts. The probabilities for Clinton and Trump, on the other hand, are low enough to sound alarms for four of the five polling locations. These exit poll results more than justify a call to audit the voting records and a profound skepticism in the results of machine counted votes. The math underlying this model dictates that this trend should level off horizontally, not start moving in the opposite direction. It means the trend is not random chance, but due to a specific cause correlated with precinct size. It is such unanticipated trends as revealed by this type of graph that motivated me to look more closely into our vote-counting process, eventually leading to conducting the exit polls in this past election. This is CVS graph for Sedgwick County. It shows Trump getting an increase of ~2% of the total vote share and Clinton losing that same amount from their respective inflection points at around 93,000 cumulative votes. These exit poll results vindicate the use of the cumulative vote share model in assessing probability of election fraud. Polling is not evidence. Starting with a false premise destroys everything that follows. As in other states, there is no inventory/accounting of ballots in Wisconsin. The number of ballots to begin the day are not verified by poll workers. Number of ballots not used, are ‘NOT’ accounted for. At the end of the day – Unused, Used and Spoiled ballots should be accounted for and signed off by poll workers. When added together, these 3 numbers should equal the number of delivered ballots accounted for. You need to back this up with evidence. Who took the exit polls? Where can we, the public, see those results and check what you have written here? I set up and managed the polls. I trained the volunteers myself, all of whom are voters here who are concerned about the reliability and integrity of our voting system. I’ll be publishing the remaining data right here, but I’m not yet through the vetting process for the data from the other races. If you don’t want to believe what I’m publishing, that’s fine. I don’t trust the official reported counts done by machine. I’m not been allowed to audit the ballots for accuracy, so I collected my own data. But unless you are willing to collect your own data, then you’ll have to trust someone else’s. Show me the proof, There has been so many bogus reports, its sickening, Yes I hate Trump, but don’t lie to Hillary supporters, show us proof. The proof is in the pudding as they say. You can file an election challenge. That’s the statutory process, one you’ve been informed of previously, and one you have not yet taken advantage of. No actually I can’t file an election challenge. Only candidates can do that. Citizens are allowed to file request for recounts for ballot questions, but I tried that in 2014. They denied me the option of reviewing the paper records for the machines. I sued. They won. You may read all of Article 14 of Chapter 25 at this link: http://www.kslegislature.org/li/b2015_16/statute/025_000_0000_chapter/025_014_0000_article/ It describes the full process for challenging elections. If you are serious about these allegations and your definitive declarations of election tampering, you need to either find an attorney, or if you have one, fire them and find a better one. And FYI, the Kansas Secretary of State’s office certified the elections on November 30. I’m not an attorney, but the plain language of the statute appears to indicate you have five days, not counting weekends, to file a challenge. That gives you til Monday. 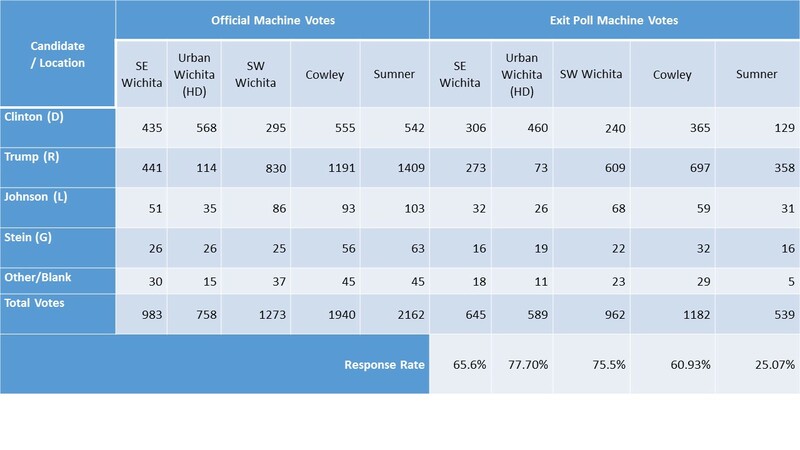 Why on earth would someone manipulate the Clinton v Trump machine counts, but not Bishop v Scapa, the one of the Wichita House districts where you were doing your exit poll? Bishop creamed the incumbent Scapa by 868 votes in a district where the seat has been traded back and forth by fewer than 50 vote for the past few cycles. Wouldn’t it have made more sense to tamper with a race where the outcome for Kansas actually mattered? I cannot speculate on the motives of people who would rig an election in Kansas for Trump. It absolutely made no difference to the outcome. But four of the five polling locations look like votes were siphoned from Hillary to Trump. We didn’t ask about Bishop/Scapa race because I limited my survey questions to races that everyone would be voting on. So you limit the data you collect, and then conclude *definitively* the machines were tampered with? Frankly, I find this approach completely irresponsible. As a Democratic poll observer supervising poll watchers across the southern half of Sedgwick County, I was in and out of Countryside (the SE Wichita polling location you’ve been citing), and I was surprised at the unprofessional behavior of your poll watchers. I watched as voters who walked past the canopy were yelled at to come back and do the exit poll. Additionally, your signage – “Citizens Exit Poll” – may not have played well with the more conservative of the voters. Frankly, it looked like what it was: A liberal operation. I would not be surprised if your results skewed just by people’s perception of the polling workers’ motivations. Your numbers do not prove your assertion: “Machine Vote Counts were Altered.” You do not do our community a service by telling us the machines are rigged when you have very thin evidence – evidence gathered by questionable means – this is true. Beth, what about the idea that Libertarian voters would be averse to sharing for an exit poll. One could, I think, make the case that they would be less willing to share as they are hypervigilant to these sorts of ‘media traps’? There may be psychological variants that effect behavior. What if they are all that paranoid and delusional? Please do math to restore my hope for my favorite Mammals. Nice work, Dr. Clarkson. Thank you. An Exit Poll cannot count early voting and absentee voting. From what I understand, there was a great Republican turnout for early voting. The folks who actually waited until Election Day to vote are not a definitive reflection of the voting numbers. This exit poll was designed to test the hypothesis that our voting machine counts are accurate. The results shown for the comparison are the results for machine votes at the same site. It is very much an apples to apples comparison from which strong conclusions can be drawn. I share Mr Witt’s concerns. I observed the exit polling at Countryside as well. Self selection of participants makes the data suspect. I qualitatively suspect mor D’s and U’s chose to participate and that scues the data likely explaining the discrepancy. I too want to see the law changed to not only allow, but also require election audits, but collecting suspect and likely biased data leads to suspect and likely biased conclusions. These questionable conclusions improperly undermine public confidence in the integrity of our elections (and I should disclose these are to opinions of a democratic member of the Kansas House Elections Committee). Because of this exit poll, the evidence for the concluding that our voting machines have been manipulated is very strong. Further, the ‘questionable conclusions’ that bother you could be easily proven false with transparent vote counts verifying that the machine counts were correct. We don’t have transparent vote counts, which is why I ran the exit polls. I have already been in contact with the FBI about this because I find the implications so concerning. Expressing concern about ‘undermining public confidence in the integrity of our elections’ is tantamount to telling me hush in response to yelling ‘FIRE’ in a crowded theater and ignoring the fire that’s raging away. If you want to improve public confidence in the integrity of our elections, then make them transparent and secure so that confidence would be justified. Currently it is not. I’m going to continue to yell FIRE until the fire department shows up and puts it out. It appears that the machine votes for all candidates were higher than than the poll votes, which makes sense because not everyone participated in the exit poll. Isn’t it possible that the people who voted Republican were more likely to refuse to do the poll? I don’t think it’s an absolute that the normal “rule of thumb of 2%” would apply in a crazy election like this, where voters across the country were not behaving in predictable ways, so I’m not sure that your assumption of fraud is valid. Did you request an audit of the machines that do have paper backups? The null hypothesis was no fraud occurred. We rejected the null hypothesis. I compared the vote share for each candidate, not the number of votes because yes, not everyone participated so all candidates got higher numbers of votes in the machine count. The 2% rule of thumb is in lieu of a more precise calculation, which I have done. Exact p-values for each candidate and site were given for the size of the discrepancy found. As far as the assumption of fraud goes, the null hypothesis was no fraud occurred. We check for normal error rates and reject the null if the error rates are too large to explain via random chance. Alternative causes like ‘shy Trump delegates would be easy to check? If only it were allowed. Non-transparent unverifiable vote counts should not be trusted. Any suspicion of fraud in counting the votes should be dealt with through transparent hand counts of ballots. Instead, we are asked to suppose that Trump voters were less likely to respond to the exit poll in four out of five location, but not the fifth? I cannot prove that didn’t happen because I cannot get access to the paper records to perform an audit. But why should I assume a different cause for the result than the one I tested for? Especially one that could be easily dispelled with transparency of our vote counts? A lack of which is why I decided to run citizens exit polls in the first place. Thank you for sticking with this. I’m starting to get the uneasy feeling that the election was rigged. I just signed a petition asking for a recount in FL. It states that Trump’s surge at the end was statistically so improbable as to be nearly impossible. Do you have information about that situation? I’m glad you’re still on this, Beth. Thanks for doing this. We need audits of all elections to make sure they’re being counted correctly. Looking at these comments, it’s concerning to me that some folks seem to be invalidating this study’s findings because convenience sampling methods were used. Sure, it should be taken into consideration as a common limitation of countless research studies, but not a reason to discredit the study entirely. People always try to discount or discredit results they don’t want to believe. It’s human nature. Alternative explanations for the results like ‘shy Trump voters’ would be easy to check and either accept or eliminate though an audits of the ballots. But if audits were allowed, I wouldn’t have been running exit polls. Non-transparent unverifiable vote counts should not be trusted. Any suspicion of fraud in counting the votes should be dealt with through transparent hand counts of ballots. I applaud you for pushing for an audit and advocating for making all voting machines verifiable. The threat of tampering is deadly serious, is a fundamental threat to our democracy and needs to be impartially investigated across the country. A danger is that there is SO much misinformation floating around – from all sides – that you risk being perceived as a part of that. It would have been better to state your results as “machine vote counts looks suspicious” or “may have been altered” instead of “Exit Poll Results – Machine Vote Counts were Altered in S.E. Kansas”. You may believe this is true and it may be true, but what you have is possible evidence, not proven fact. Nice to have experts studying and discussing this. Please explain why we use machines that can be tampered with, AND why we don’t create a paper trail that can be audited. Isn’t there a way to secure an accurate tally of votes? Yes, an accurate tally of votes can be secured by hand counting paper ballots publicly at the polling place on election night. Why do we use unsecure machine without a paper trail instead? That’s a good question without a good answer. You need to share this information far and wide and do you best to get it seen by representatives, the DNC and the media. And ignore the naysayers. We have a tendency as democrats for infighting, rather than focusing on the true enemy.